colour variation, each louvre has a unique beauty and character. Our custom made slim Aero 90 mm Shutters are made from plantation Western Red Cedar Wood and finished with natural wood wax or 2 pack eco polyurethane paint. There are 4 reasons why you opt for our Slim Line Shutters. Cedar wood is the best insulation and naturally beautiful grain. Why our shutters is made from western red cedar timbers? For hundreds of years, humans have known about Western Red Cedar as a versatile building material: the Native Americans even called it tree of Life because it served so many of their basic construction needs, from totem poles and housing structures to ceremonial masks and canoes. By the turn of the 20th Century, Western Red Cedar was known worldwide as a beautiful and durable building material with a seemingly endless variety of uses. Western Red Cedar looks good and performs well in countless applications in and around the home, from panelling, siding, doors and windows to blinds and shutters, pergolas spa and sauna panelling to garage doors,fenching and gates. yet the fine resonance of the timber on the thin edge have also made it a top choice in musical instruments. This naturally uniform texture and lightweight structure also make Western Red Cedar incredibly easy to work with: it planes , saws and glues with minimal effort or energy, and holds finishes exceptionally well. making it the obvious choice for discerning architects and specifiers the world over. The natural oils produced in Western Red Cedar act as a pure preservative, protecting the timber from weathering,decay and insect attack. These extractives – thujaplicins and water-soluble phenolics – are highly resistant to a number of woodrotting fungi, giving North American Western Red Cedar a Class 1 durability rating aqccording to Australian standards and also the highest durability standard of any softwood listed in the EN standard. absorption means much less movement and warping in wet weather or humidity, so it will remains as stable and Strong in years to come as it did the day it was installed. The low wood density of Western Red Cedar also makes it a much betters insulator than other soft woods and is far superior even to steel, brick and concrete. Western Red Cedar is the ultimate green building material. It produces fewer greenhouse gases, requires less energy to produce than alternatives and comes from a renewable, sustainable resources. Equally important, Western Red Cedar is carbon neutral. 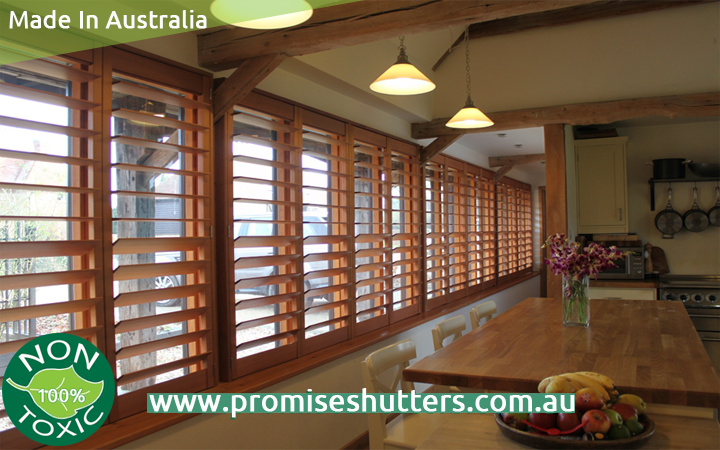 Shutters made from natural Western Red Cedar allow excellent ventilation since they are fully adjustable. Cedar offers excellent colour retention (it does not fade or yellow once coated) and you can colour-match to any pastel colour. and help keep heat inside your home in winter.